There is a problem with advertising a vacancy on a job board. Not just the general problem of the decline in qualified candidates having to use job boards to find a new role but also the problem of standing out in a sea of other text all advertising the same type of vacancies. How can you make plain text stand out when it's just the same as everything else? Better yet how can you make it truly relevant to your target audience? If you take the time to look at what your competitors are putting on job boards you might notice some strange behaviours. How many of the "adverts" are actually just job descriptions? A job description and an job advertisement perform two very different functions and should look very different. If you produce a job description and post that instead of telling a reader how amazing it would be for them to work for your company you're posting a list of demands in HR Speak. This is the equivalent of a car manufacturer televising the turning pages of the technical manual, it's just so boring! Stretching the analogy further an advert for a new job should be just as aspirational as for a new car - we want all the cornfields on fire, explosions and leather clad luxury of a car ad. We want excitement, something that will appeal to the target audience and something that demonstrates that we, as an employer, understand them. Today I worked with one of our developers to write a job advertisement in C#. What would have taken me an age obviously only took him a few seconds to write but the feedback was the best I've ever heard for any advertisement, after we finished he said - "I would apply". We're currently trialing a number of different styles of advertising for our jobs over on our StackOverflow company page. It's particularly useful because we can see both page views and applications so we're better able to judge the effectiveness of an ad. I'm hoping this ad in code as well as other versions we're working on might encourage those that see them to explore a little further. 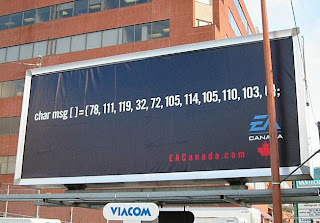 What other ways are there to stand out when advertising jobs online? How can you make the limitations of plain text on a job board into advantages that will make your adverts stand out from the crowd? In recent years there have been a number of landmark instances using more non-traditional tactics. New companies wanting to make an impact, older organisations seeking out particular known individuals or just a grand gesture of recruitment, recruitment as an event or spectacle, existing to generate a larger story with the resulting publicity driving even more people to learn about the company. Further, frustrations over "access" to these candidates forces more innovative companies to imagine more and more innovative solutions to get their message across. Some are clever, some confrontational, but all of them have made an impact beyond their original target audience. Here are some of my favourites from over the years. 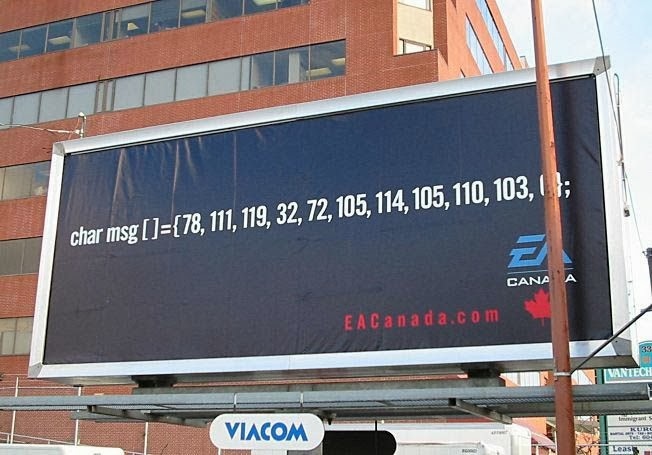 In 2003 Electronic Arts in Canada took out some billboard space near the offices of rival games developer Radical Entertainment. Near enough to be read by the developers at Radical who had no problem working out that the message reads "We're Hiring". The results of this obviously confrontational stance by EA didn't really do them much good - the team at Radical garnered a lot of positive press. The public love an underdog it seems. Founder and CEO at Radical, Ian Wilkinson sums it up well "This has been far more aggressive than past attempts, but I have no reason to believe that this will be any more effective." So overtly hostile attempts can often be jarring and work against you - at the very least they convey a lot more about the brand than was originally intended. Here, EA were the giant trying to take down an independent success story, it didn't work but it has been done better. These are both still broadcast messages, though it's true they act as a filter for talent, so the organisations only have to deal with those people who are able to answer the questions. What if you already know who you want to talk to? Not a type of person or a profile - what if you actually know the person? Video game start-up Red 5 Studios handpicked about 100 dream candidates, spent time learning about their backgrounds and interests from social networks and personal blogs, and airmailed each one a personalized iPod, inside 5 artistic nested boxes complete with a recorded message from CEO Mark Kern. More than 90 recipients responded to the pitch, three left their jobs to come on board, and many more potential hires discovered the company through word-of-mouth buzz generated by the search. Whilst it is true that these types of initiatives have a higher initial cost for the more price-conscious organisation this can be mitigated by the quality of the potential audience - they targeted their "dream" employees. The saving in costs versus the same approaches made through an third party recruitment firm are not to be sniffed at. Chances are a single hire made through an agency would have exceeded the total cost of this project. There's also a third more intangible return on investment, the virality of this approach. I am confident that there is a secondary impact of this type of approach the effect on other employees in the target organisation when told about the parcel and now the impact of this type of approach being shared on social media - the outlets of which have increased exponentially since Red 5 Studios did this in 2007. Facebook did something very similar in 2013 for hardware engineers. As a pilot program they sent branded Raspberry Pi's to potential candidates they had identified as a good potential fit. 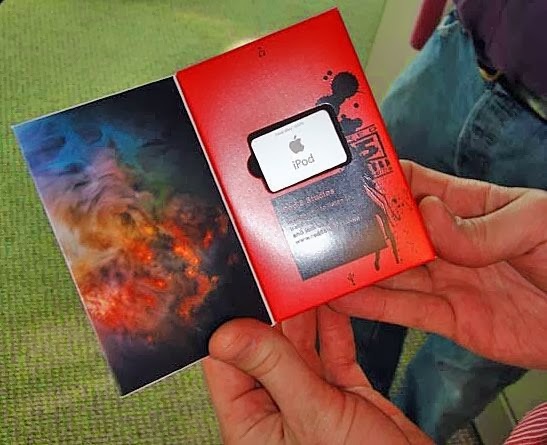 On connecting the credit-card-sized single-board computer they were presented with a personalized video giving them a tour of the working environment and a brief of where they would potentially fit in. This type of approach is hard to ignore. A mobile handset manufacturer could send their latest handset with a willing hiring manager's number pre-installed? This would both show off the product and demonstrate the value the company see in the candidate. Spotify already send tongue-in-cheek playlists to potential candidates, demonstrating the product in a fun way as well as letting the candidate know they are hiring. There are dozens of these initiatives going on all the time. Sitting back and waiting to resumes is unforgivable - what can your organisation do to differentiate itself?